I was wandering the Cape Anne historical museum this winter and noticed in a 19th century ship's medical kit a vial labeled "sugar of lead." This is lead acetate, which tastes sweet -- and is reputed to have been used as a sweetener is days past. Other metal salts are sweet as well - yttrium salts and beryllium salts can both taste sweet. Beryllium was first identified in 1798 by chemist Louis Vauquelin as an oxide in beryl and emeralds (emeralds are beryls with a bit of chromium added!). Since the chloride salt of the new element tasted sweet, the editors of the journal which published Vauquelin's findings suggested he call the oxide (or earth) glucina from the Greek, glyks (γλυκυς) for sweet. The elemental symbol used was Gl. Beryllium was suggested as alternative once other sweet metal salts were found, for the gemstones in which the element was first identified. It took until 1949 for this to become the official IUPAC name of the element with four protons. 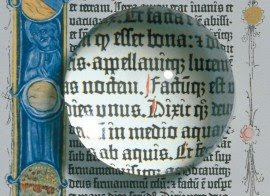 Beryls were used to make "reading stones," magnifying glasses, then eventually ground into lenses for eyeglasses.